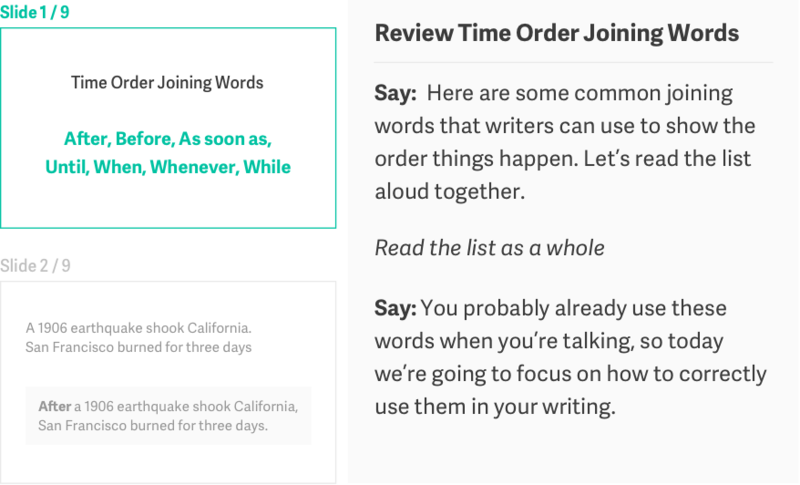 Quill Lessons enables teachers to lead whole-class and small group writing instruction. 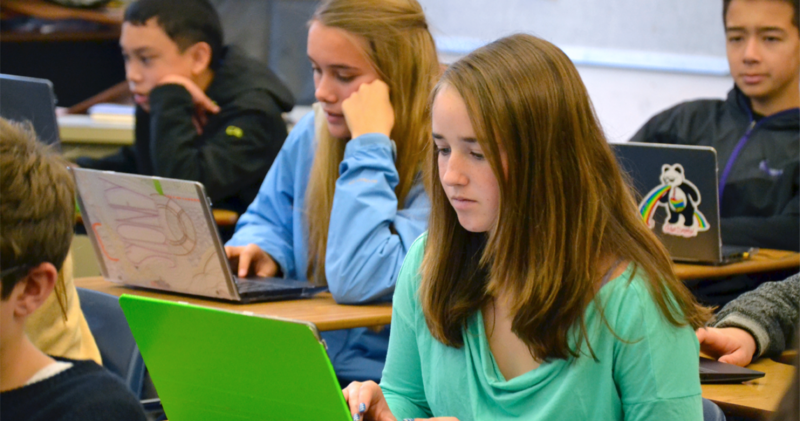 Teachers control interactive slides that contain writing prompts, and the entire class responds to each prompt. 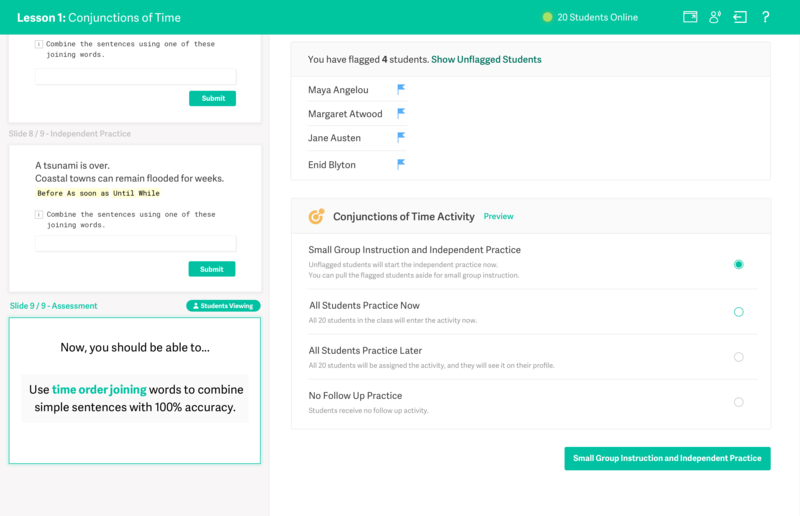 Each Quill Lessons activity provides a lesson plan, writing prompts, discussion topics, and a follow up independent practice activity. 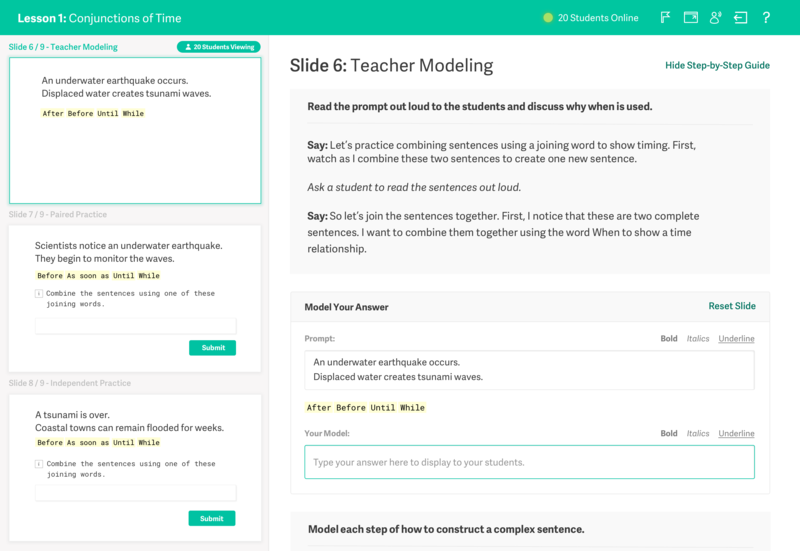 Quill Lessons provides a series of interactive slides that allows the entire class to work together with their teacher. 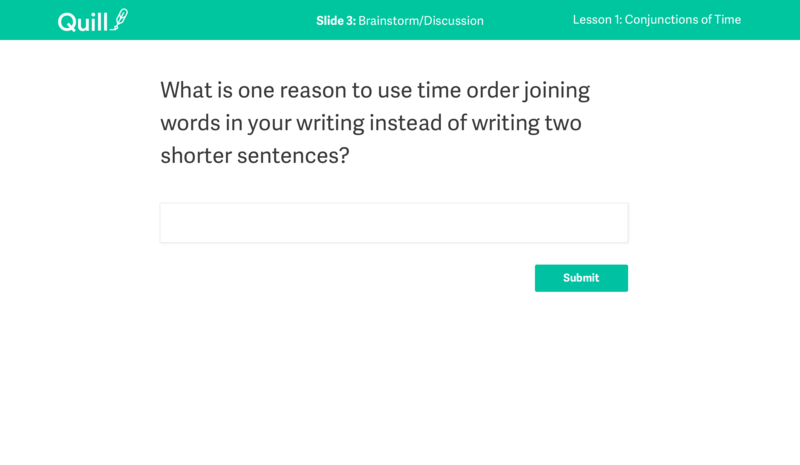 The slides contain interactive writing prompts, and your students will write their answers on their devices. Teachers then project selected answers back to the class to facilitate a class discussion. Each slide contains a step-by-step guide to help you introduce new writing skills and content topics. The step-by-step guide also includes suggestions on how to discuss students’ answers and how to model strong writing to the students. 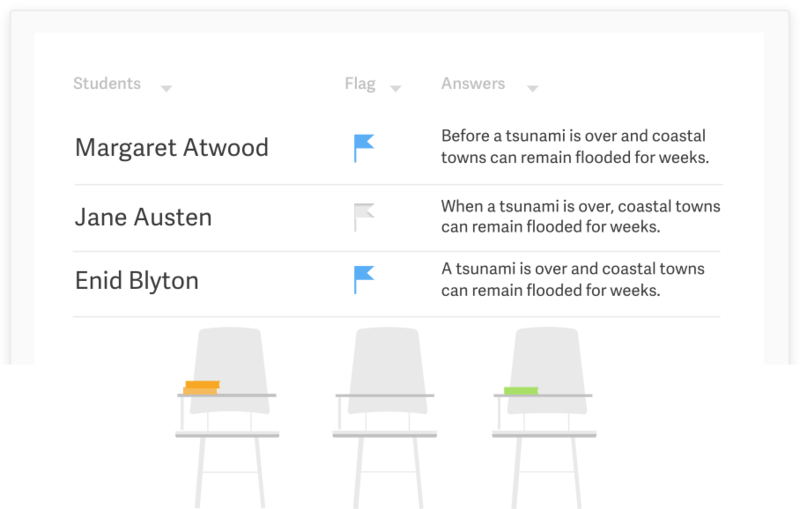 See your student answers in real-time, and facilitate a conversation by selecting both strong and weak answers to project to the class. As a class, students can discuss why certain sentences are stronger than others. When the students respond, you can click on the “flag” button to select students who may need extra support. Students don’t see that they are flagged, but at the end of the lesson, you can pull aside flagged students for small group instruction. Teachers can use the step-by-step guide to introduce a writing skill and model strong sentence construction skills. 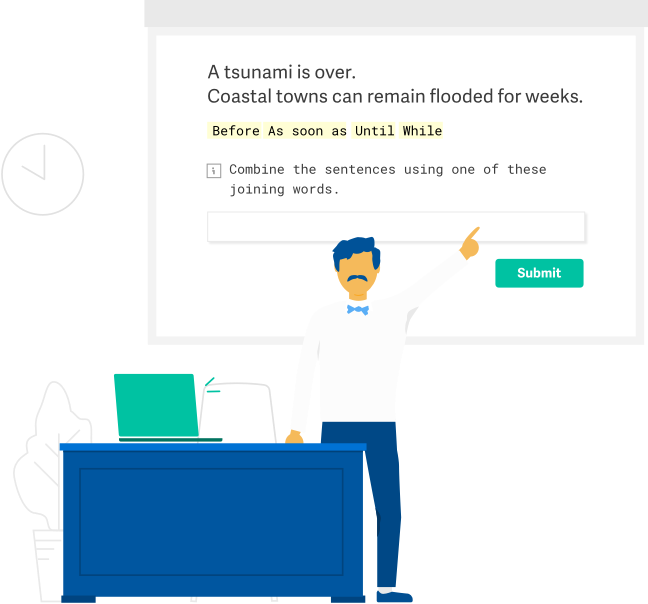 Interactive slides allow students to answer open-ended questions, combine sentences, and write paragraphs that can be shared with the whole class. 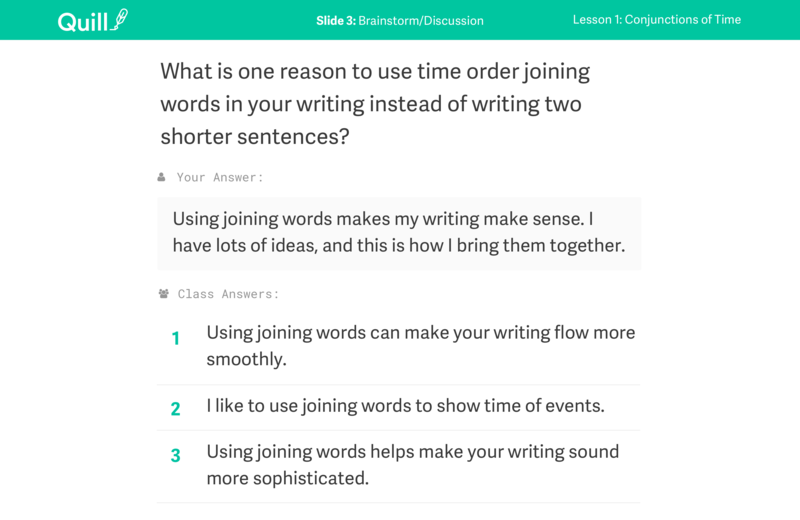 As students answer questions, the teacher can view and select student responses to display to the class. The teacher can also flag students who may need extra support or small group instruction. 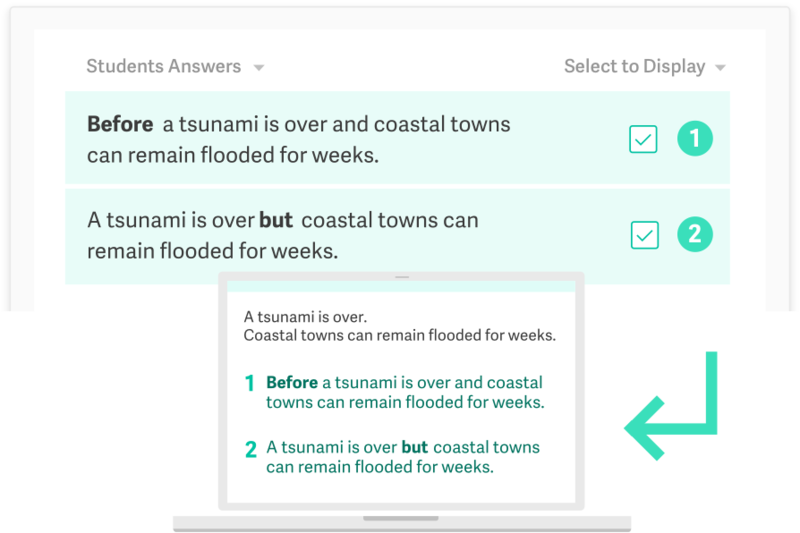 Students can compare their answers with selected class answers. The teacher and the students can discuss how to make the sentences stronger. Each lesson includes a follow-up independent practice activity to reinforce the in-class lesson. Teachers can select how they would like to assign practice at the end of the lesson. "The kids LOVED seeing their responses come up live as we went through the lesson. Eighth-grade students were literally begging me to project their answers or asking me to allow them to resubmit an answer because they'd just gotten a better idea from another students example. An excited class learning grammar from each other, now that's a good day in ELA class! I can't wait till Friday to do it again." If you are still not sure where to start with Quill Lessons, read the How To guide to see the step by step details to set up your first lesson. Sign up to start using Quill Lessons in your class today!